I am following this saga with fascination because it’s a great study in mass crowd psychology and investing. It blows my mind that this stock can have a $1.3 billion market cap with almost no evidence of a mineable resource other than small, pumpkin-size “seeds” of gold samples. I exchanged emails with my junior mining company insider to get some interpretation of the results and affirmation of my view: “These nugget deposits are very difficult to model and drive mining engineers absolutely nutz! This is what happened with Pretium’s first shot at a published resource at the Brucejack project in BC. The gold is coarse and not equally and predictably distributed, so the consultant had a very difficult time modeling the deposit and therefore coming up with an agreeable resource estimate. Jim Rogers stated in an interview with Bloomberg that “the next bear market will be worst in my lifetime,” adding that he didn’t know when that bear market would occur. The stock market has become insanely overvalued. Before last week, several market-top “bells” were ringing loudly. The stock market could easily drop 50% and, by historical metrics, still be overvalued. Gold, silver and the mining stocks have been pulling back since late January. In fact, I warned my Mining Stock Journal subscribers in the January 25th issue that the sector was getting ready for bank-manipulated take-down. In the latest issue I offered a view on when the next move higher could begin. Mining stocks in relation to the price of gold and silver have become almost as undervalued as they were in December 2015, when the sector bottomed from the 4 1/2-year cyclical correction. 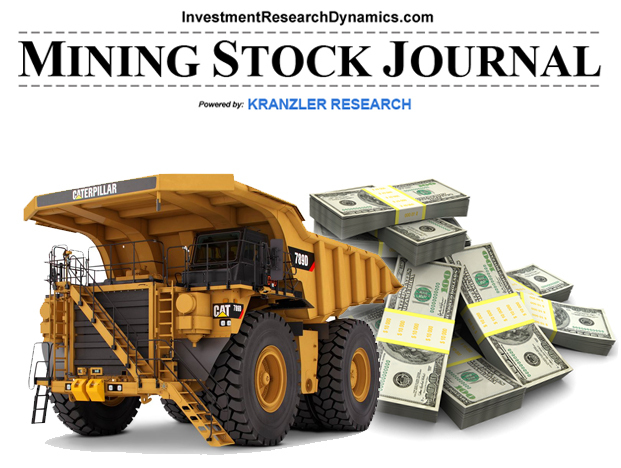 In a recent issue I listed my five favorite junior mining stocks. The U.S. dollar has had the worst January since 1987. There’s a lot of reasons why the stock market crashed in October 1987, but the declining dollar was one of the primary catalysts. The rest of the world, led by China, is methodically and patiently removing the dollar as the world’s reserve currency. The cost for the U.S. Government to fund its rapidly expanding spending deficit is going to soar. Absent the ability to print unlimited quantities of electronic dollars, the U.S. Government’s credit quality is equivalent to that of a Third World country. The cost to buy down-side protection has never been cheaper. No one, I mean no one is short or hedged this market. When slide starts, it will quickly turn into a massive avalanche. You will have to be set up with hedges and short positions or you will miss the money that will be made from taking a lonely contrarian view of the market. My subscribers who shorted my homebuilder stock idea two weeks ago are now up 17.7%. That’s if they shorted the shares. They are up even more if they used puts. 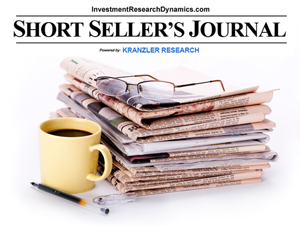 If you are interested in learning how to take advantage of the coming stock market crash, you learn more about the Short Seller’s Journal here: Short Seller’s Journal information. Doc asked me last minute to fill-in for Eric Dubin, who’s M.I.A. somewhere on the shoreline of southern France, on Silver Doctor’s Metals and Markets weekly podcast. Among other topics we discussed why the current trading action in the precious metals paper market feels very similar to trading in the spring/summer of 2008 – ahead of the great financial collapse crisis and why the Fed/bullion banks are making it obvious that they seek to scare investors away from buying precious metals with their “shock and awe” price-takedowns. But one big difference between now and 2008 is that these “zip-line” vertical drops in the paper are being met with aggressive buying from the eastern hemisphere physical buyers, thereby limiting the size, intensity and duration of the price-hits. As of the latest COT report release Friday which details the constituent trader positions through last Tuesday, the trader positions are moving toward a highly bullish set-up for gold and silver. In silver, the hedge funds are now net short silver futures and the swap-dealer segment of the bullion bank positioning is net long. In gold, the hedge funds have aggressively reduced their net long position and the swap dealers are long to a relatively large degree. Historically, this position shift has preceded major bottoms. In the latest Mining Stock Journal, I present a silver producer who’s stock that was ruthlessly taken recently. I review the details in-depth, including my conversation with the CEO, and discuss why this is an opportunity to buy into a major producing company at irrationally low price level based on the facts of the situation. I also lay-out the call options I put into the fund I manage in large quantities to bet that my assessment has good probability of being correct. You can find out more about subscribing here: Mining Stock Journal info. Question: Why do Central Banks and Governments hate gold? Just like everything else in the western financial system, the paper trading markets are leveraged beyond redemption. The amount of paper “claims” on actual physical gold was estimated to be 100:1 in 2010. We can assure you that ratio is much higher now. On the Comex alone, for instance, if more than 9% of the April open interest in gold futures were to stand for delivery – based on the currently declared 1.4 million ounces of gold reported as being “available for delivery” (registered) – the Comex would default. The entire open interest in gold futures is 60x greater than the amount of gold available for delivery. This is just the publicly traded paper gold derivatives. There’s also the shady world of OTC gold derivatives. We have no idea what kind of leverage is embedded in these contracts. But the total notional amount of OTC “precious metals” derivatives according to the OCC’s latest quarterly report on OTC derivatives (Office of the Comptroller of the Currency) is over $28 billion. Just to highlight the degree to which the Government goes in order to hide the facts about the gold and silver market, the OCC used to break out OTC precious metals derivatives into the categories of “gold” and “silver and other.” Now the OCC reports just “precious metals.” What is it that the Government and banks are hiding? The amount of leverage embedded in a Comex futures contract, based on the current amount of margin required, is about 25:1. There’s no telling how much leverage is embedded in the OTC derivatives agreements. All we know is that the disclosure requirements are becoming increasingly more opaque. Silver futures began trading on the CBOT in 1969. But gold futures were not around until 1974, three years after the U.S. closed the gold window, completely disconnecting the dollar from gold. Gold futures were developed to enable the Fed and the U.S. Treasury to control the price of gold as a means of reinforcing the legitimacy of the dollar as a fiat currency used as the world’s reserve currency. While the price of gold has been heavily manipulated since at least the 1960’s, when the U.S. was running out of enough gold to fulfill its obligations under Bretton Woods, the manipulation and “shock and awe” price attacks are used as a form of propaganda that is designed to discourage investors from converting fiat dollars into gold and silver. It’s a powerful weapon used by the Deep State against gold and economic freedom. What Happens To Gold & Silver When Trump Attacks The Dollar? Make no mistake, it’s going to get ugly at some point in 2017. Elijah Johnson at Silver Doctors invited me to discuss why I believe Trump’s policies, assuming he gets anything passed and implemented, will be phenomenal for gold. Another factor not being discounted or widely discussed is an acceleration in the rate of inflation over and above the ability of the Government’s CPI sausage grinder to mute actual price inflation in everyday consumables. Major Silver Bounce – Can It Last? The bullion bank gold cartel pulled out all of its stops last week in order take down the price of gold and silver. Particularly useful was selling by longs connected to fear over the week-long closure of China in observance of the Chinese New Year’s celebration (Year of the Rooster). Interestingly, last year gold was volatile during the Chinese New Year week off but traded sideways, not lower. In addition, this upcoming week features the FOMC meeting and the January employment report. On average and in general, both of these events typically are accompanied by a take-down in the price of gold. On Friday, however, after the obligatory smashing of gold and silver associated with Comex options expiration (Thursday), gold snapped back sharply $9 from its Thursday low of $1181 and silver soared nearly 50 cents from its Thursday low. 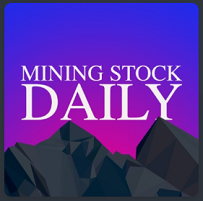 If you agree with the views in the above podcast, the Mining Stock Journal offers great junior mining stock ideas to help you take advantage of the next move higher in the precious metals sector. 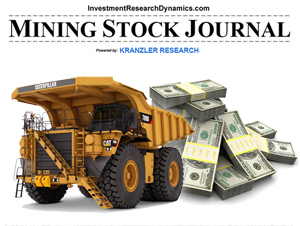 You subscribe using this link: Mining Stock Journal subscription link. As subscription includes all the back-issues and superior customer service.